Hello readers! Is there anyone still out there? I’m sorry for my extended absence. The absence was unplanned. In fact I have a few recipes and photos of food I have made this summer that I had intended on sharing but never got around to doing it. Let me briefly explain, to me food blogging was starting to seem like a giant popularity contest. Other blogs I would read would occasionally mention all the readers they had or I would see hundreds of comments on each post knowing that I would never have an audience like that. At first that saddened me and I quit writing, I have never been popular before why did I expect popularity through blogging. Basically it was a pity party, I magically wanted a pretty website with hundreds of readers. This time off has made me realize that I miss sharing my recipes with others. So what if I don’t have legions of readers. Those big food sites deserve all the traffic they get. They have pretty websites with pretty pictures and eloquent words. I am ok with my twenty or so visitors (Hi Grandma!). I have learned a lot about cooking and food photography by doing this site. My site may not have the most eloquent descriptions or the most beautiful photos, but I am learning and that makes me happy. So that’s that. I hope to be back to a regular posting schedule. How many times have you opened up the pantry or the refrigerator and while staring at full or semi-full shelves said “there is nothing to eat”? This is something I have said countless times since childhood I am sure. I have been fortunate in my life to never know the true statement of there is nothing to eat, there has always been food to eat. Today I opened up my pantry and thought “there is nothing to eat” and then it dawned on me how much food there actually was in the pantry. 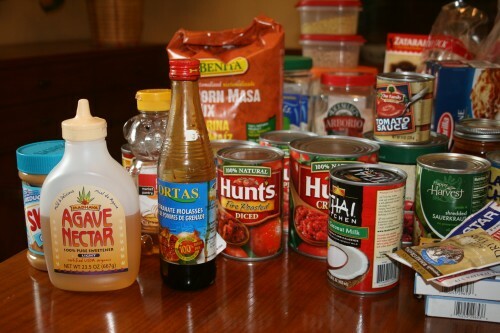 Every item in my pantry was bought for a reason even if that reason has long been forgotten. With two grocery stores less than half a mile a way I have gotten lazy. It is easy to run to the storeÂ (or have my husband stop on the way home from work) to pick up a specific ingredient for a meal instead of getting creative and using what I have on hand. The laziness and disregard for my grocery budget is stopping today. 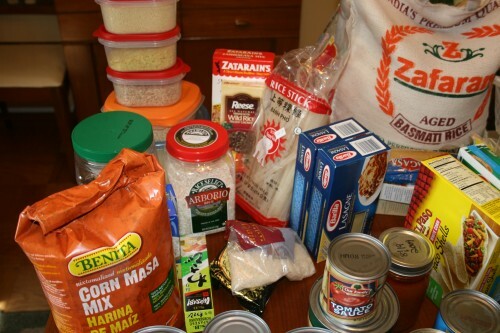 I am challenging myself (and you) to plan meals centered around what you have on hand. 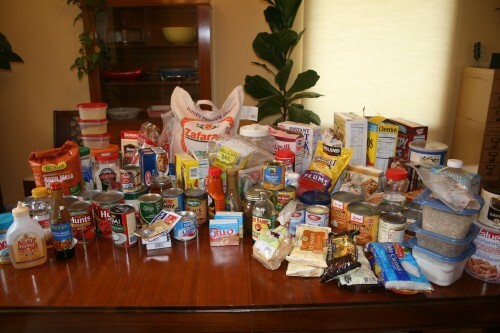 I emptied my pantry shelves onto my dining room table. I was shocked to see that my table was covered with “nothing to eat”. It is embarrassing. 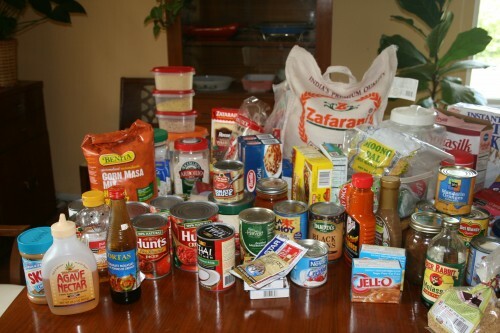 I took pictures to show you what my “nothing to eat” looks like. There are no pictures of my refrigerator and freezer, they aren’t filled to the brim, but there is food in there I will use to make meals for my family. In the freezer there are several whole chickens, a pot roast, and shredded cheese which will help round out some of the creative meals. Here is everything from my pantry laid out in an embarrassing amount. There it is all laid out for you. 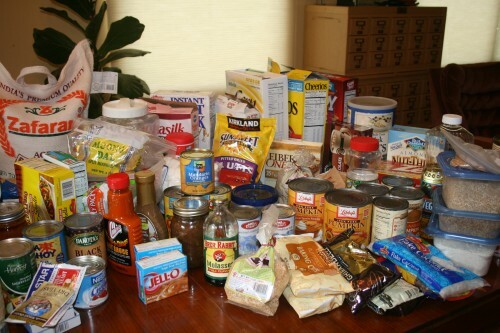 If you empty out your pantry please share your photos with me. 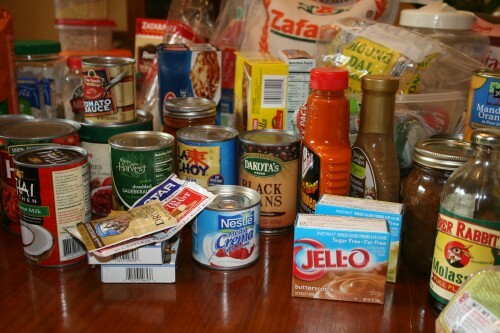 The recipes I will post in the next week will be made using these ingredients. We are all out of bread so that is the first from the pantry food item I am going to make. I am really hoping to make it a week or more without having to go to the grocery store (other than for milk, butter/oil, and eggs). I am looking for any meal suggestions you may have for me after looking at my ingredients. Or if you have any questions about what something might be let me know in the comments and I will get back to you. Welcome back, I LOVE reading your site and I think the descriptions/pictures are just as good if not matter than any of the mega-foodie blogs!!! HI! I am very glad that you are back. I missed reading you. Always check every day or two to see what the Gates are eating. 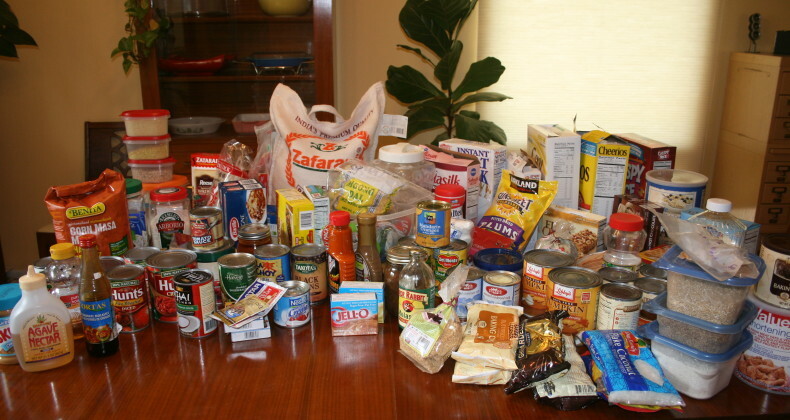 Can you imagine if I emptied my pantry out on my table–how many tables would I need? although, I have been better. Got something for you to experiment with–bean dip like they serve at our favorite Mexican place–you know the one. Know my Great-Granddaughters love it too. Hey, I’ve been lurking for a long time now, and for what it’s worth, you were the first food blogger I started reading. Yes, even before The Pioneer Woman or Smitten Kitchen! And I am very interested in this experiment. I am also working hard on eating what’s in the house. It seems like I’m always stocking up on staples when they go on sale but then I buy more instead of eating what I have. For me, it’s more that I am afraid to eat it up because then I won’t have it anymore! Ryan: It was scary pulling everything out and seeing how much there really was. It kind of put things into perspective. Dr. Maureen: Thanks for coming out of the shadows. I am guilty of lurking sometimes too. When something is on sale it is hard for me to resist it, the grocery ads came out today but I don’t think I am even going to look at them. I need to eat down my pantry before I even begin to plan a shopping trip. I need to make it 1 week of no grocery shopping first. Glad you didnt give up on the blog!! We too often have the “I’m not hungry for that syndrome”. Way too often! 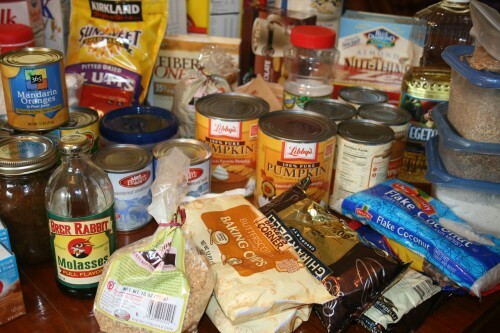 In the winter when I have more time to cook is when we will plan meals out of the pantry. The kids will never let me live down the “lasagna” I made using the “clean out the pantry” theme. It was quite healthy but barely edible. Which worked in my favor as the teens seemed more interested in helping cook in case I would make such a dish again.